I'm setting this week's challenge over at Daring Cardmakers - I'd like to see something mythical or fantastic on your creations this week. Since time immemorial we seem to have been telling tales of the inexplicable, of mermaids, dragons, unicorns, pixies, selkies etc... bring it up to date a bit and you might find aliens, hobbits or gremlins. Where will your imagination take you? Mine took me to dragons - he's a bit more Land of Honalee than Game of Thrones though! I found some punch art dragons with a google image search and just used those as a guide to do my own thing with dies. Combining basic shapes means you can tackle almost any theme without splashing out on specialist stash! In doing my own thing, I added ears and a tongue which made him look more "finished" to me. The tongue, neck and his spikes are hand cut, everything else is die cut or punched shapes (some halved or partially cut/recut). I sponged ink round all the edges as well as over the "scales" of his neck (embossing folder). 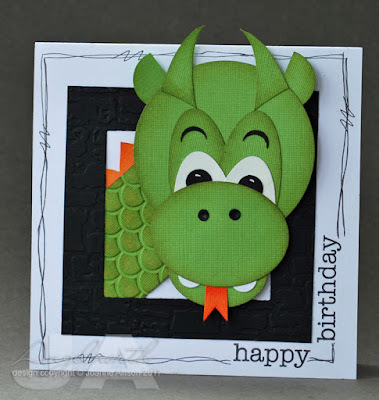 He's poking his head through a castle window (stone texture again an embossing folder) to say happy birthday. What a clever card ... I love it. Such a fun card Joanne - love the dragon! A very interesting challenge. This is adorable! I love that punch art dragon and your fun doodling around the "frame." Hugs! !